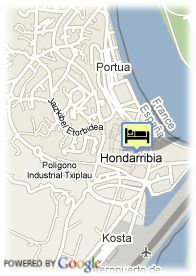 Mayor, 5, 20280 Hondarribia, Spanje. Hotel with charm in Guipúzcoa. In other times, residence of kings and noble people, this exquisite and romantic Renaissance palace invites you to relive passed times and enjoy a smooth and enveloped atmosphere. 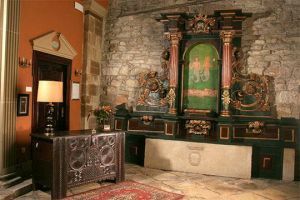 The Pampinot Hotel, declared historical monument, is located in the heart of the old town of Hondarribia, in Guipúzcoa. Inside the walls of the medieval city, area of narrow and paved roads and elegant buildings. The Pampinot Hotel offers 8 comfortable rooms, all unique and with its own personality. As peculiarity, the roofs of these premises stand out, too, being artistically painted by hand, in different colors and motives. A fabulous library with the best universal literature about the sea, a lively Tea Bar Room and an elegant living-room also stand out among the facilities of the Pampinot Hotel. Enjoy the best time in Hondarribia and its privileged environment: long beaches, picturesque fishing villages and a large cultural offer from the Basque Country, such as the Guggenheim and Chillidaleku museums.